Few if any fruit or vegetable does more good for your body than sweet corn. Sweet corn is so good for you it is hard to decide where to begin. Let’s begin with the cancer question. Can it reduce your risk of cancer like so many other vegetables? The answer is a resounding yes. 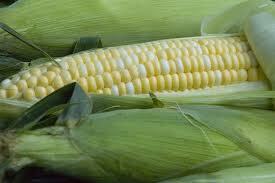 Sweet corn contains more ferulic acid than any other fruit or vegetable. Ferulic acid is an antioxidant that is instrumental in the prevention of cancer and heart disease. When sweet corn is cooked, this antioxidant increases. In fact the longer you cook it, the higher the antioxidant content! Even more amazing is that research indicates that this particular antioxidant aids in the prevention of neurodegenerative diseases like Alzheimers. Do you keep losing things? Does your memory need a boost? Mine certainly does so I am definitely increasing corn in my diet. Sweet Corn is high in thiamine, or vitamin B1. Thiamin increases cognitive function and is used by our bodies to produce acetylcholine which is essential in our ability to maintain memory capabilities. People with Alzheimers disease have low levels of acetylcholine. Corn can help with that too. It contains the antioxidant zeaxznthin which is the yellow pigment in corn. This antioxidant protects against age related eye diseases. We talked about thiamin and how we need it for memory. Well, it also helps our body produce energy. But it isn’t alone. 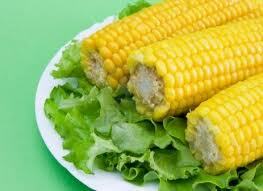 Sweet corn contains panthothenic acid. This acid, rich in vitamin B, helps us produce energy when under extreme stress. Thanks to vitamin B9 or folate, corn reduces our risk of heart attack. Statistics have shown a 10% reduction in heart attacks and for smokers, a 37% reduction in lung cancer for subjects that regularly consumed foods rich in folate. 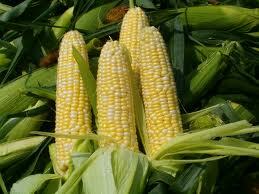 One medium sized ear of corn supplies about 10% of the recommended daily allowance of folate for an adult. One cup of sweet corn has approximately 10% of our daily requirement of protein. I don’t usually think of a vegetable as having protein, so I was surprised to learn this. We need protein to repair cells, boost our immune system, and build muscle. The best part about getting our protein from corn is that unlike many other sources of protein, corn is low in fat. Well, at least it is until you slather it in butter! Potassium is a mineral we lose when we sweat and is required for proper heart and muscle function, as well as bone strength. One cup of sweet corn provides 7% of our daily requirement of potassium. We can receive 10-15% of our daily requirement of vitamin A from one cup of sweet corn. The amount required differs between men and women. Vitamin A strengthens tissue and moistens mucus membranes in the lungs, nose and throat. Yes Corn is Sweet – But So Is The Feeling You Will Have When You Step On The Scales! Did you know that an ear of corn has about the same calories as an apple and less than one fourth of the sugar? It’s true! I know you have heard about corn sugar being bad for you. Actually it is processed corn sugar that is bad. The sugar in an ear of corn itself is natural and accompanies a boatload of vitamins and minerals. Sweet corn is gluten free. The calorie content comes from simple carbohydrates like glucose and sucrose. We all know corn is a starchy vegetable. That really means that corn is high in carbohydrates but that does not necessarily make it bad. We need carbohydrates for mental and physical energy and one cup of cooked sweet corn will supply about 24% of that need. Remember we get protein from corn without the fat and protein helps us to feel full after eating. So does fiber. Fiber also helps stabilize blood sugar levels, prevents constipation and reduces the risk of high cholesterol. You will only get about 10% of the fiber you need from corn. However, if you add a serving of sweet corn to your menu you do more than reap all of the health benefits mentioned earlier. You will feel full longer, increase your energy level, and probably lower your caloric intake!